This image of a dwarf spheroidal galaxy in the constellation Fornax, released April 2, shows a satellite of our Milky Way and is one of 10 used in Fermi's dark matter search. The motions of the galaxy's stars indicate that it is embedded in a massive halo of matter that cannot be seen. ATLANTA — While scientists still don't know what makes up the mysterious dark matter thought to dominate the universe, a new study of dwarf galaxies orbiting the Milky Way presented here Sunday (April 1) at the American Physical Society has chipped away at the possibilities, offering intriguing hints about the nature of dark matter. Dark matter is the name given to whatever makes up roughly 80 percent of the mass in the universe, holding galaxies together and exerting its gravitational force on regular matter. Yet dark matter is also invisible and, so far, impossible to directly detect. One way astronomers aim to study the elusive stuff is by looking at its effects on observable things. For example, one theory suggests that dark matter is made of exotic particles called WIMPS (weakly interacting massive particles). Sometimes, these particles should encounter their antimatter partner particles, anti-WIMPS, and the two should annihilate each other as matter and antimatter always do. This annihilation would produce radiation in the form of high-energy gamma-rays that telescopes should be able to observe. The recent study used NASA's Fermi Gamma-ray Space Telescope to search for these gamma-rays in the small dwarf spheroidal galaxies that orbit the Milky Way. Siegal-Gaskins and her colleagues analyzed 12 of these mini galaxies orbiting the Milky Way, and found basically no gamma-rays. The result means that if dark matter is made of WIMPS, the particles don't annihilate with their antimatter counterparts very often. That reduces the varieties of WIMPS that could explain dark matter. "For the first time, we're now starting to prove the combinations of particle parameters that are favored by cosmology," Siegal-Gaskins said. "We're really starting to probe the really interesting theoretical models of dark matter." One property of microscopic particles is called cross section, which can be thought of as the area of the particle, predicting how often it will collide with other particles. Fermi's lack of gamma-ray sightings in the dwarf galaxies means that if dark matter is made of WIMPS, they can't have some of the cross-section values that conventional models have predicted. The researchers hope that continued observations of more of the Milky Way's dwarf galaxies could help eliminate further possibilities for dark matter, helping to corner the elusive particles. "This study is based on two years of data," Siegal-Gaskins said. 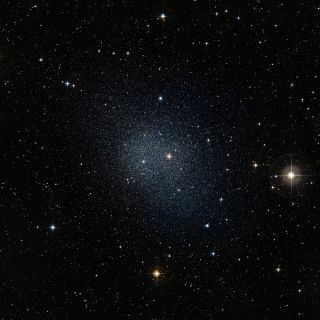 "In the next few years, it's quite possible that more dwarf spheroidal galaxies of the Milky Way will be discovered. We have the potential to push that limit even lower. I think we have a lot of exciting prospects."